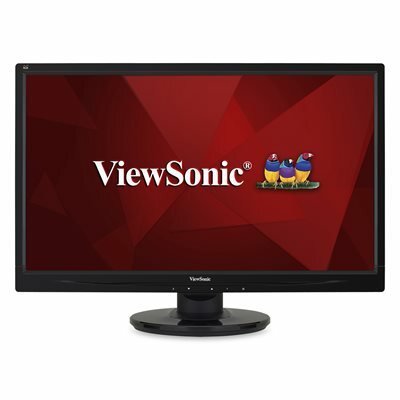 The ViewSonic VA2746MH-LED is a widescreen monitor with an LED backlight and glossy, thin-bezel design ideal for use in the home or at the office. It delivers stunning brightness and contrast, while a quick response time ensures crisp pictures and smooth playback. As a complete multimedia package, the display also includes a pair of integrated speakers. dimensions 5.6" x 25.4" x 20.7"
The ViewSonic® VA2746mh-LED is a 27" widescreen monitor with an LED backlight and glossy, thin-bezel design ideal for use in the home or at the office. With Full HD 1920x1080 resolution and a 50M:1 MEGA Dynamic Contrast Ratio, the VA2746mh-LED delivers stunning brightness and contrast, while a quick 5ms response time ensures crisp pictures and smooth playback. As a complete multimedia package, the display also includes a pair of integrated speakers. VGA and HDMI inputs provide flexible and convenient connectivity, while a VESA-mountable design offers additional mount flexibility. With an environmental friendly LED backlight and ViewSonic's proprietary Eco-mode, the VA2746mh-LED reduces users' total energy cost. In addition, a 3-year limited warranty, along with one of the industry's best pixel performance policies, make the VA2746mh-LED a great long-term investment.